I wrote these programming instructions so that dear Internet will remember these until the next time I’ll need them. The actual history with the keyboard – someone had poured liqueur on the keyboard and did not clean it straight after the fact (everybody should). I included these cleaning photos in a separate blogpost. This way I have paid some 30 or 35 EUR for the partially working bestia – touch sensitivity was lost due to previous repairman accidentally swapping the sides of rubber ribbons. While aftertouch is missing, the rest of the functionality of the keyboard is adequate (albeit not on the level of newer pricey touchpad enabled models). I occasionally use the keyboard to play on the closed gigs (a village dance band, seven members, thus nothing special). The most demanding part while preparing for a gig is to program the keyboard so that the keyboardist should apply minimum thinking while on the stage. It is not necessarily easy to fiddle with the synth controls in a dark room while exposed to the elevated levels of sound. This way, we should automatize as much as possible. The rompler I use as an actuator during the gigs, is a Roland SC-88VL. Why this old toy? Because I have two identical instances of SC-88VL and it gets very convenient to have one at home, and yet another at the rehearsal room (a public space, not suitable for keeping too valuable gadgets). 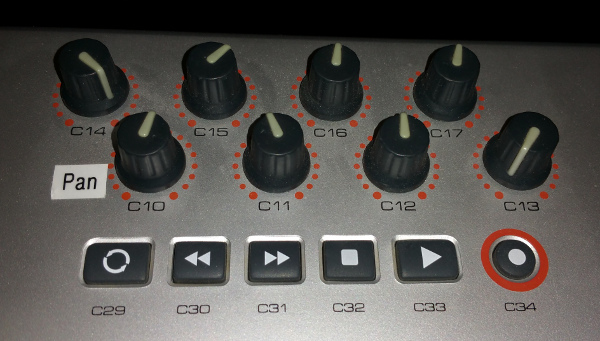 Thus Roland SC-88VL will serve as a simple example of a target throughout the programming excercise. For a 7 songs long gig I have defined certain sounds, or – following the official terminology: Patches – and had to recall them by programming relevant MIDI messages. I need to change Modulation, Volume, and some extra parameters during the gig (not automatized yet). To my mind, the German word das Register (von Orgelbau) expresses the meaning much better than English “Program Change” euphemism. Thus: I need to program my keyboard to change the Registers. A disclaimer: I absolutely do not master all the finesses of either Oxygen or SC-88LV programming. What you see here, is the absolute introductory level. M-Audio manual is somewhat difficult to follow due to logical fallacies. Thus, provided you have nothing valuable saved on non-volatile EEPROM of your Oxygen, it would be wise to attempt a factory restart. Why? Because this way you will know where you are and you also will know the memory chip actually works. 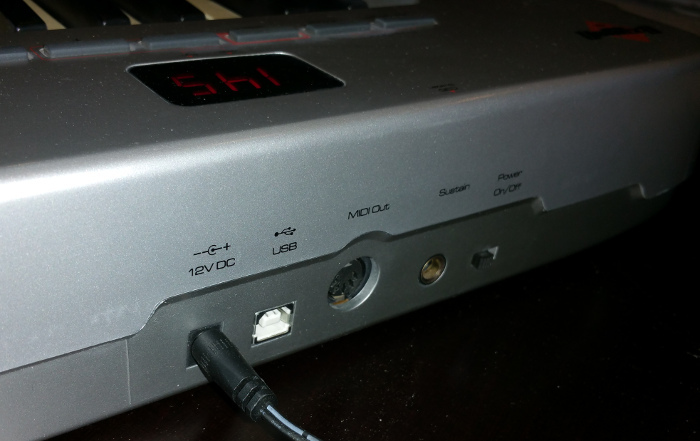 To factory reset the M-Audio Oxygen 61, Power ON the keyboard while keeping both + and – pushed. Only release these two buttons when the numbers on the display change (some 2-3 sec delay). The manual for a later Oxygen Air (page 48) includes some valuable information – how the presets 1-10 are supporting various external softwares. This way, Preset 01 has all 9 continuous MIDI sliders programmed in a more or less foolproof way – suitable for some simple gig work While preset 10 is a clean set of NO sliders programmed so that you will not interfere with the valuable settings of your more expensive synths. Presets 02-09 are prepared to some popular DAW environments like ProTools. With this idea in mind, we attempt to program the rotating knob C10 and assign a Continuous MIDI controller #010 to it. 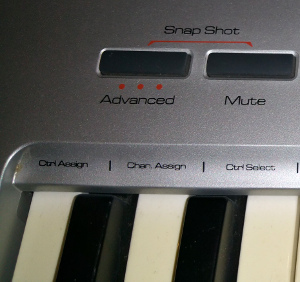 Do communicate it to the keyboard, which knob/slider/button you plan to program next. For this purpose, fiddle with the slider (rotate it up and down). Numbers on the display will reflect the values of the pot. However, after leaving the control alone, after 2 sec, the display will stabilizes and indicate the Midi CC# associated to the control. press (once) the button “Advanced” on the corpus and release it. The result: three dots are lit together with the current MIDI CC#. press (once) the utmost left key on the keyboard. It corresponds to note “C” but has some extra label over it: “Ctrl Assign”. sequentially press numbers 0 and then 1 and then 0 (a.k.a. “010”) using the fourth octave “G”, “A”, “G” keys. These keys are additionally labelled as “0”, “1”, and again “0”. Of course, the display changes with each press and has now “0.1.0.” on it. press the utmost right key on the keyboard, which, by the accident, is the highest “C” on the keyboard. The key has “Enter” label near it. DONE. Should you need to reprogram any other sliders, then the programming skeleton will be the same. I always recommend musicians to act like programmers – always test what you just created. Do play a chord using some organ sound, turn the pot C10 left-right and get convinced the panning works now. Reboot the keyboard (a “Power OFF – 10 sec delay – Power On – 5 sec delay” cycle) and be convinced your changes overlived the restart. This gig I had 7 songs to play. In the last song it is recommended to variate the piano sound over the verses. Two extra buttons could be useful for the purpose. There are two plain facts to keep in mind. The first one – while patches on most synths are numbered with base = 1 (i.e. 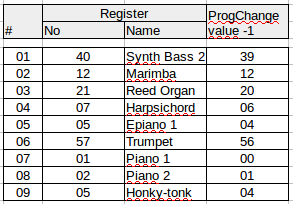 starting the count from 1) the MIDI standard actually transfers numbers with base = 0. Put otherwise, the synths generally avoid to mislead musicians having Sound #0 on their displays, something that still is completely bearable for IT ppl. For that reason, we have to decrement all our Patch Numbers to get a meaningful result. Another bloody truth to keep in mind is that so far we only are fiddling within the standard 128 MIDI Patches …. oops, 0..127 of these. We don’t use Bank numbers, neither MSB or LSB parts of those. That was the real reason behind attempting the Factory Reset … these memory cells contain zeros now and won’t confuse the dumber synths. SC-88VL actually has Bank Changes implemented in a weird (non-orthogonal) way so that one needs constant consulting against some non-orthogonal tables, printed in manuals (starting page 60+). Might be we will describe more complex it in future. Yet third factoid to mention, is, we use decimal numbers throughout this text while any actual MIDI device uses hexa numbers (0x00 .. 0x07F) thus a special care is needed with MIDI analysers. 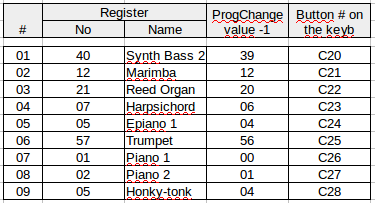 We want to programs the pushbuttons numbered C20 .. C28 with these decremented ProgChange Values from the song table. E.g., to achieve sound #040 “Synth Bass 2”, we have to program the button C20 to transmit a decimal value equal to 039. Do communicate it to the keyboard, which button to program. Do push the C20 button! The display will show the MIDI continuous controller number for a while (should be “145” or we will face problems later) and shall then calm down in 2 sec displaying the MIDI CC # currently associated to the the particular button. press (once) the button “Advanced” on the corpus and release it. The result: three dots are lit together with the MIDI CC #. 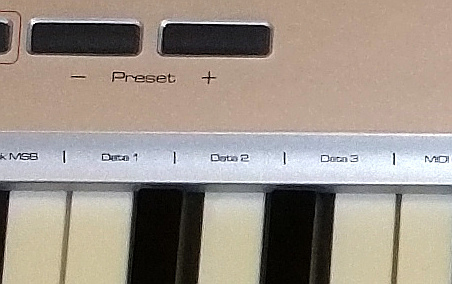 press (once) the second octave “C” key that has the extra label “Data 1” near it. sequentially press numbers 0 and then 3 and then 9 (a.k.a. “039”) using the fourth octave key “G”, then fifth octave “C” and “H” keys. These keys are additionally labelled as “0”, “3”, and then “9”. Of course, the display changes with each press and has now “0.3.9” on it. press the utmost right key on the keyboard, which, by the accident, is the highest (sixth) “C” on the keyboard. The key has “Enter” label near it. It is advised to test what we just created. The keyboard should be restarted to be sure all the magic capabilities will survive the reboot. One should sequentially push buttons C20 .. C28 to be sure the sounds will change each time. It is wise to check that the rotation knobs and sliders (programmed previously) have survived the button programming, too. how to program/store more difficult Program Changes (these involving Bank Change LSB and MSB together with the Program Change message, or to say in plain way, these extending outside of the initial MIDI-1 spec with its 127 sounds). The task is perfectly doable with this particular keyboard but could need some preparations on the SC-88VL. The task will be much more easy to do with more orthogonal synths (i.e. these having continuous soundbanks). storing the modwheel, filter cutoff, chorus and reverb positions. Should be at least partially doable on Oxygen 61. M-audio manual for Oxygen-61 is suffering certain logical faults while describing the storage model, thus using the “Store” function based on how you think it should work, will lead to unexpected results (data loss). A valuable factoid on programming the Data values – better do program one “Data x” memory location at a time. That means to reliably program a full MSB LSB ProgChange command set, one has to use three “Advanced”, “CtrlAssign” , Data, <numbers>|, ENTER” sequences, one for each “Data x” parameter. Another valuable programming reference is available at Cakewalk forums. Some special programming tips and tricks are available there.